Home » Sports » Basketball » NBA – Davis Trade Talk A Detriment to Lakers Punters? NBA – Davis Trade Talk A Detriment to Lakers Punters? Whilst Lebron James didn’t expect to stroll through the Western Conference, I’m sure he expected better than 10th place after the first 54 games. Trading for Anthony Davis could jumpstart the Lakers NBA season, but should they be avoided in the meantime? Since LeBron James’ injury in Oakland on Christmas Day, the Lakers have won just 7 of their 20 NBA games. They currently find themselves 10th in the West and in real danger of missing the playoffs. Many of these losses haven’t been to premier competition either, including both the Knicks and Cavaliers. With the sheer depth in the Western Conference this season, those are just games that you can’t afford to drop. Another Woj bomb revealed that the Lakers were willing to offer Kyle Kuzma, Brandon Ingram, Lonzo Ball, and 2 first-round picks for the services of All-NBA big man Anthony Davis. Many fans and pundits have suggested that this is too much to give up, especially given LeBron’s age. Kyle Kuzma has emerged as a very legitimate rotation option this season, averaging a shade under 19 points and 6 boards. Brandon Ingram is also considered by many to have the same potential as Kevin Durant. A frustrating player at times, Ingram is averaging a well-rounded 17 points, 5 rebounds, and 3 assists this season. Even the often-maligned Lonzo Ball has every chance of being a very good NBA Point Guard. Whilst it is a lot to give up, players like Anthony Davis very rarely come available. The elite big man is having another spectacular season, averaging 29.3 points and 13.3 rebounds. Over the past 3 seasons, Davis has definitely established himself as a top 7 player in the NBA. He has averaged at least 28 points and 11 rebounds in each of those seasons, shooting over 50% from the field in the process. More than capable on the defensive end, Davis averages an astonishing 2.6 blocks and 1.7 steals per contest. He currently finds himself just behind Paul George at $4.33 to win Defensive Player of the Year. With Boston preparing a lucrative offer come June, now is the time for the Lakers to act. 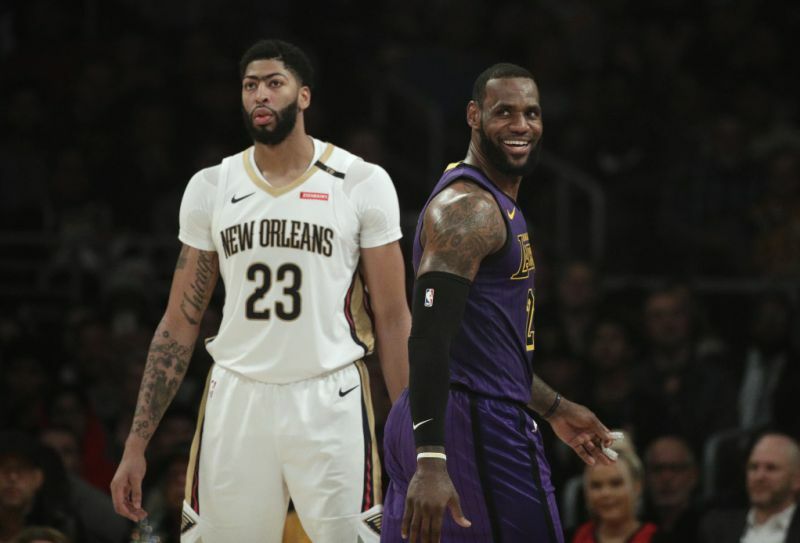 Especially with no clear second team behind Golden State, pairing AD with LeBron could do wonders for the Lakers chances of a deep playoff run. Should Punters Avoid the Lakers? Whilst the Lakers have been performing poorly lately, punters shouldn’t avoid them. If anything, this poor recent form actually provides some line value in their favour. Failure to play hard every night and they’re in very real jeopardy of missing the playoffs completely. Even if some of their young guns get traded, the Lakers have enough veteran depth to ride it out in the short term. One thing’s for sure however, a healthy LeBron and AD in the playoffs can compete against anybody.